The child is very young and gets their first teeth. The actual time at which the first tooth arrives can vary widely between individual children, but the parents needs to start brushing the child´s teeth as soon as the first teeth appears. Step 0-2 years has a small head with soft bristles. 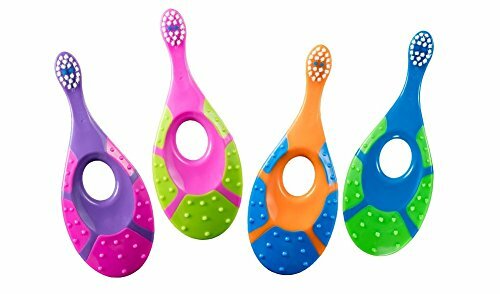 Small children can have irritated gums, and therefore the handle of the toothbrush can also be used as a teething ring. The short neck of the toothbrush prevents the toothbrush being inserted too far into the child´s mouth. At this age a toothbrush should be used under parental supervision, and the grip on the handle of the toothbrush Step 0-2 years is also suited for an adult. Step 0-2 years has strong stimulating colors. Made in Malaysia under license of Jordan AS, Norway. Non toxic & Chewing grip are safe and good to stimulate baby's gum (BPA and Phthalates Free).